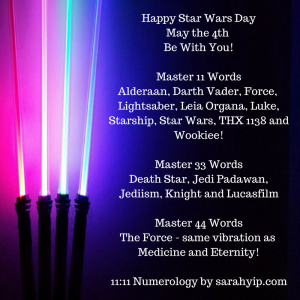 Home11:11Star Wars Movie Numerology – May The 4th Be With You aka The Master Numbers Strike Back! Happy Star Wars Day! May the 4th be with you. I’ve always loved this saga, and looking at its numerology, I now know why. Star Wars contains many examples of Master Number 11 and 33 numerology, which indicate something or someone with the potential to raise consciousness on the planet. Many people equate Master Numbers (especially 11 and 11:11) with Starseeds. Who knows, maybe the stories are true?! I’ve based all analysis on the Pythagorean system – read more. In its highest vibration, Master 11 represents people standing up for each other (the 1’s are side by side), and leaders growing leaders. Master 11 looks like an equals sign on its side and encourages humanitarian pursuits. Many politicians and entertainers have 11 energy. Words and names such as enlightenment, psychic and Jesus add to 11. For more 11 words, read Why do I see 11:11 on Clocks part two, or see my 11:11 page. Words, names or dates of birth that add to 11 have a Spiritual Messenger quality. As a psychic in Brisbane, I believe that 11 represents inner conflict that leads to oneness and connection. As a 29/11 lifepath, this has been the story of my life. Find your lifepath here. 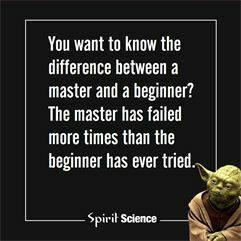 Yoda’s quote to the right sums up Master Numbers in a nutshell! In its lowest vibration, Master 11 encourages split personalities and addiction i.e. a person with two faces. 11 reduces to 2 so a Master 11 carrier under stress may ‘over-two it’ and burn out trying to make others happy. Darth Vader (47/11) – he is Luke’s father – it’s amazing how darkness can bring light into being. We are all a mixture of both (I note that the words energy, light, black and white all equal 11). THX 1138 (29/11) – the name of George Lucas’s first film and a motif in Star Wars. The number 1138 is an in-joke of his. Wookiee (38/11). I’m sure there are more! Words, names or dates of birth that add to 33 have a Spiritual Teacher quality. The word Teacher even adds to 33 (!) In its highest vibration, Master 33 is about teamwork that leads to group healing. 33 looks like two pairs of lips. It invites us to speak our truth in a way that frees others – to take back our voices and power. I love that MICHAEL adds to 33 (he’s the chief Archangel – find your Guardian Angel). More on Master 33 numerology. In its lowest vibration, Master 33 creates know-it-all dictators, who force their opinions on others. As an aside, BUDDHA adds to Master 22, which is about large-scale cooperation. Read more on Master 22. 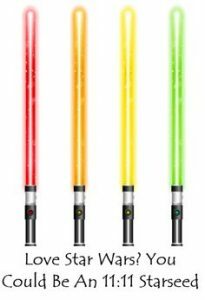 -Jedi Master has a vibration of 41/5, the same as the phrase Yin Yang. This term is the highest formal rank obtainable in the Jedi Order. 41/5 energy is about balancing our heart (4th chakra) and logic (1st chakra). Incidentally, our 5th chakra or throat, is the con-neck-tion point between our head and heart. -The Force has a vibration of 44/8, the same as words like Commitment, Eternity, Happiness, Swimming and Medicine. It’s about devoting your heart (4th chakra) to serving the public good (the 8th chakra is about philanthropy and overcoming greed). What a beautiful message! The heart’s electromagnetic field is thought to be 60 x greater than that of the brain (see here). As they say, love conquers all. That’s why wishes often come true when you’re passionate about them. Padme Amidala’s name has a 44/8 energy – she is the respected Queen who gives birth to Luke Skywalker and Leia Organa. -Stormtrooper and Grand Master Yoda both add to 66/12/3. 6 is about having an open mind (or not!) Read more on 666. -Order 66 adds to 99/18/9, a symbol of finality. This was one of a series of decrees that almost wiped out the Jedi Order. And in case you were wondering, Director George Lucas was born 14/5/1944 (note the 444 huge heart chakra), making him a 28/10/1 Action Hero lifepath…words like STARSEED and NEW AGE add to 28/10/1 as well. He was born to lead us home. Read more on 1 lifepath numerology, including why they become bad boys and Prime Ministers! 28/10/1’s love to stand out from the pack – they are alpha males and females, with healing gifts. I hope you’ve enjoyed this whistlestop tour of Star Wars movie numerology. Surely these patterns are more than a coincidence? It would not surprise me if many people who love Star Wars also carry Master Numbers, have composite whorl fingerprints, and/ or see 11:11 and repeating numbers on clocks. Starseeds unite! Oh, and guess which other franchise has lots of Master numbers? Yup – it’s Harry Potter (11’s coming out of its ears). That will have to be another blog. Hi Melanie, thank you so much for your feedback – I also have other articles on 11 (just google me & lifepath 11). Really glad you enjoyed this blog – I had great fun writing it! Hope to stay in touch – if you are on facebook I’m there as The Numbers Queen. Best wishes.